Eric’s wife, together with their kids, are on a weekend in their weekend house that is located near the lake. Eric is not with them. He decided to stay in the house because he had a lot of work to do. Since the day of their coming home is near, Eric decided to make his family a great surprise. He likes to clean the entire house and do all the repairs that need to be done in the house. He likes to make everything perfect for his family so he will start cleaning very soon. Maybe this house is not that ruined but like every other house, it asks for some renovation from time to time. And since Eric likes to make the house perfect, he will have a lot of work that needs to be done. And he could do that on his own but it would be even better if you could help him do the job. That way he will be less tired and he will be able to notice every tiny detail that is not right in the house which means that he will get closer to what he calls, the perfect house. Let’s help Eric make the big surprise and welcome his family in their perfect home. 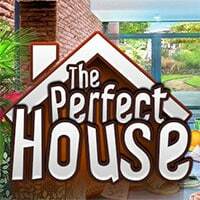 The Perfect House is a free online hidden object game on Round Games.